Audrey J. Weiss, Ph.D., William J. Freeman, M.P.H., Kevin C. Heslin, Ph.D., and Marguerite L. Barrett, M.S. This Healthcare Cost and Utilization Project (HCUP) Statistical Brief presents characteristics of hospital inpatient stays involving an ADE from 28 States in 2010 and 2014. ADE-related stays are reported by the origin of the ADE: those that originated during the inpatient stay versus those that were present on admission to the hospital. The most common causes of ADEs are presented overall and based on origin of the ADE. Differences between 2010 and 2014 are provided for the rate, average cost, and average length of stay involving ADEs by the cause and origin of the ADE. Table 1 presents utilization and patient characteristics of inpatient stays involving an ADE based on whether the ADE originated during the stay or was present on admission to the hospital, in 2010 and 2014. The overall number of hospital stays involving an adverse drug event (ADE) remained relatively stable from 2010 to 2014, but stays shifted from ADEs that originated during the stay to ADEs that were present on admission. In 2014, 70.5 percent of ADEs were present on admission, compared with 61.0 percent in 2010. Antibiotics and anti-infectives, systemic agents, and hormones were the most common specific causes of ADE-related hospital stays. From 2010 to 2014, the rate of stays involving an ADE increased the most for ADEs caused by smooth muscle and respiratory drugs (up 24 percent) and decreased the most for ADEs caused by cardiovascular drugs (down 18 percent). Rate of stays decreased 24 percent, but the average cost, length of stay, and mortality rate increased (27, 19, and 12 percent, respectively). Rate of stays decreased most for cardiovascular drugs; average costs and length of stay increased most for water, mineral, and uric acid metabolism drugs. Rate of stays increased 16 percent, and average costs increased 15 percent; length of stay and mortality rate remained relatively stable. Rate of stays increased most for systemic agents; average costs increased most for sedatives or hypnotics. Notes: The table reports values rounded to the nearest tenth. Percentage change is calculated using unrounded data input values. Other payers are not reported. From 2010 to 2014, in these 28 States, the number of inpatient stays involving an ADE overall remained relatively stable but shifted from ADEs that originated during the stay to ADEs that were present on admission. The total number of inpatient stays involving an ADE remained relatively stable in 2014 compared with 2010, at approximately 1.6 million stays each year. However, the number of stays involving an ADE that originated during the hospital stay decreased 27.2 percent, from 638,937 in 2010 to 465,456 in 2014. At the same time, the number of stays involving an ADE that were present on admission increased 11.3 percent, from 997,892 in 2010 to 1,110,725 in 2014. Overall, the percentage of stays with an ADE that were present on admission increased from 61.0 percent in 2010 to 70.5 percent in 2014. Consistent with the number of stays from 2010 to 2014, the rate of stays involving an ADE decreased 23.8 percent for ADEs that originated during the stay (from 282.0 per 10,000 stays in 2010 to 214.9 per 10,000 stays in 2014) but increased 16.4 percent for ADEs that were present on admission (from 440.5 per 10,000 stays in 2010 to 512.7 per 10,000 stays in 2014). The average cost per stay, length of stay, and in-hospital mortality rate for stays involving an ADE were higher when the ADE originated during the inpatient stay than when the ADE was present on admission. The costs, length, and mortality rate for stays involving an ADE that originated during the stay increased more from 2010 to 2014 than for stays involving an ADE that was present on admission. Compared with inflation-adjusted hospital costs in 2010, the average cost for an inpatient stay involving an ADE that originated during the stay was 27.0 percent higher in 2014 ($28,089 vs. $22,115). For stays in which the ADE was present on admission, the average hospital cost was 14.9 percent higher in 2014 than in 2010 ($13,308 vs. $11,577). The average length of an inpatient stay was 1.6 days longer (19.1 percent higher) in 2014 than in 2010 for stays involving an ADE that originated during the stay (10.2 vs. 8.6 days). In contrast, the length of stay was less than half a day longer (4.2 percent higher) in 2014 than in 2010 for stays involving an ADE that was present on admission (5.9 vs. 5.6 days). Similarly, the average in-hospital mortality rate was 11.5 percent higher in 2014 than in 2010 for stays involving an ADE that originated during the stay (3.9 vs. 3.5 percent). In contrast, the mortality rate was virtually unchanged at approximately 3.2 percent in 2010 and 2014 for stays in which the ADE was present on admission. Among western States, the rate of stays involving an ADE that originated during the stay decreased from 2010 to 2014, whereas the rate involving an ADE that was present on admission increased. Between 2010 and 2014, the rate of stays involving an ADE that originated during the stay decreased 53.6 percent among western States, from 420.8 to 195.2 per 10,000 stays. During this same time period, the rate of stays involving an ADE that was present on admission increased 65.3 percent, from 310.5 to 513.4 per 10,000 stays. In other regions, the change in rates was of much smaller magnitude but was in the same direction (decreasing for ADEs that originated during the stay and increasing for ADEs that were present on admission), with one exception. Among northeastern States, the rate of stays involving ADEs that originated during the stay increased 8.1 percent. 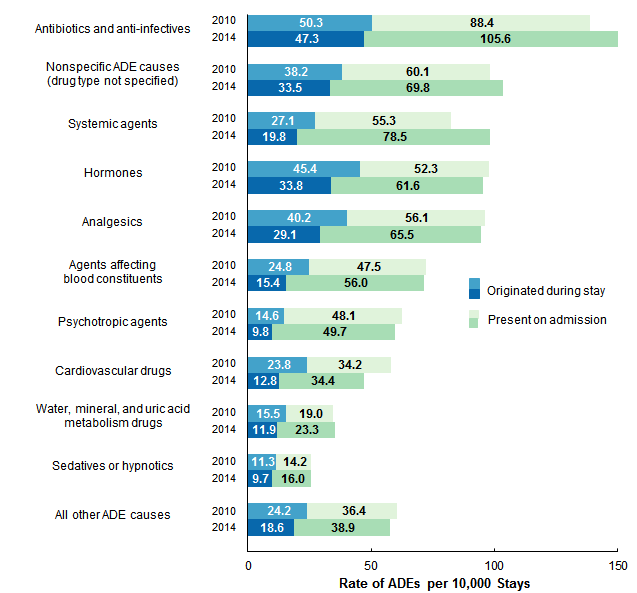 Table 2 shows the percentage and rate of inpatient stays involving ADEs (of any origin) by the cause of ADE in 2010 and 2014, sorted by the most common ADEs in 2014. The percentage change in the rate of stays for the 2 years also is presented. Note: Hormones include steroids, insulin, and other hormones. Analgesics include opiates/narcotics and nonsteroidal anti-inflammatory drugs (NSAIDS). Systemic agents include antineoplastic drugs, antiallergy and antiemetic drugs, and other systemic agents. a Percentages across all ADEs sum to greater than 100 percent because some inpatient stays involved more than one ADE cause. Antibiotics and anti-infectives, systemic agents, and hormones were the most common specific causes of ADEs associated with inpatient stays in 2014. In 2014, over 20 percent of all inpatient stays involving ADEs were caused by antibiotics and anti-infectives. From 2010 to 2014, the rate of stays involving ADEs caused by antibiotics and anti-infectives increased by 10.5 percent, from 137.2 to 151.5 per 10,000 stays. Systemic agents were the third most common cause of ADEs among inpatient stays overall (behind nonspecific ADE causes), at 13.5 percent of stays involving ADEs in 2014. From 2010 to 2014, the rate of stays involving ADEs caused by systemic agents increased 21.3 percent, from 78.0 to 94.6 per 10,000 stays. The fourth most common ADE cause was hormones, at 13.3 percent of stays involving an ADE in 2014. The rate of stays involving ADEs caused by hormones remained relatively stable over time, at 94.9 per 10,000 stays in 2010 and 93.3 per 10,000 stays in 2014. From 2010 to 2014, the rate of stays involving an ADE increased the most for ADEs caused by smooth muscle and respiratory drugs and decreased the most for ADEs caused by cardiovascular drugs. The largest increases in rate of stays involving an ADE between 2010 and 2014 occurred for ADEs caused by smooth muscle and respiratory drugs (24.1 percent increase), systemic agents (21.3 percent increase), and antibiotics and anti-infectives (10.5 percent increase). The largest decreases in rate of stays involving ADEs between 2010 and 2014 occurred for ADEs caused by cardiovascular drugs (17.7 percent decrease), other specific drugs (16.1 percent decrease), and vaccines (12.8 percent decrease). Figures 1-4 present information about the 10 most common causes of ADEs identified in Table 1. Less common ADE causes are combined into a single "all other ADE causes" category in these figures. 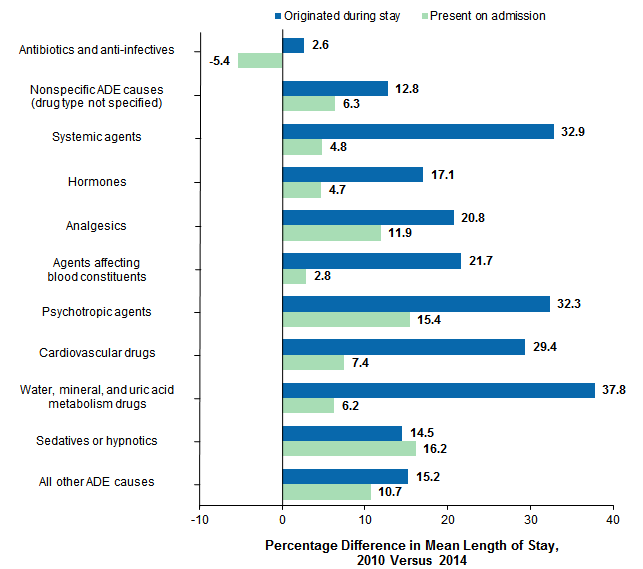 Figure 1 presents the rate of inpatient stays for the most common causes of ADEs in 2010 and 2014. Results are presented separately for ADEs that originated during the inpatient stay and those present on admission to the hospital. Notes: Some stays included ADEs that originated during the stay and ADEs that were present on admission. These stays are counted once for each origin type; thus, the sum of the rates across origins may be higher than the overall rate for ADEs (as shown in Table 2). Bar chart that shows the rate of inpatient stays involving ADEs per 10,000 stays in 28 States in 2010 and 2014 by cause and origin of ADE. Antibiotics and anti-infectives: 2010: 50.3 originated during stay, 88.4 present on admission; 2014: 47.3 originated during stay, 105.6 present on admission. Nonspecific ADE causes (drug type not specified): 2010: 38.2 originated during stay, 60.1 present on admission; 2014: 33.5 originated during stay, 69.8 present on admission. Systemic agents: 2010: 27.1 originated during stay, 55.3 present on admission; 2014: 19.8 originated during stay, 78.5 present on admission. Hormones: 2010: 45.4 originated during stay, 52.3 present on admission; 2014: 33.8 originated during stay, 61.6 present on admission. Analgesics: 2010: 40.2 originated during stay, 56.1 present on admission; 2014: 29.1 originated during stay, 65.5 present on admission. Agents affecting blood constituents: 2010: 24.8 originated during stay, 47.5 present on admission; 2014: 15.4 originated during stay, 56.0 present on admission. Psychotropic agents: 2010: 14.6 originated during stay, 48.1 present on admission; 2014: 9.8 originated during stay, 49.7 present on admission. Cardiovascular drugs: 2010: 23.8 originated during stay, 34.2 present on admission; 2014: 12.8 originated during stay, 34.4 present on admission. Water, mineral, and uric acid metabolism drugs: 2010: 15.5 originated during stay, 19.0 present on admission; 2014: 11.9 originated during stay, 23.3 present on admission. Sedatives or hypnotics: 2010: 11.3 originated during stay, 14.2 present on admission; 2014: 9.7 originated during stay, 16.0 present on admission. All other ADE causes: 2010: 24.2 originated during stay, 36.4 present on admission; 2014: 18.6 originated during stay, 38.9 present on admission. Across all ADEs, the rate of hospitalization involving ADEs that originated during the stay was lower in 2014 than in 2010. Conversely, the rate of ADE stays present on admission was higher in 2014 than in 2010. For all causes of ADEs that originated during the inpatient stay, the rate of stays was lower in 2014 than in 2010. For example, the rate of stays involving ADEs caused by antibiotics and anti-infectives that originated during the stay decreased from 50.3 to 47.3 per 10,000 stays from 2010 to 2014. For all causes of ADEs that were present on admission, the rate of stays was higher in 2014 than in 2010. For example, the rate of stays involving ADEs caused by antibiotics and anti-infectives that were present on admission increased from 88.4 to 105.6 per 10,000 stays from 2010 to 2014. 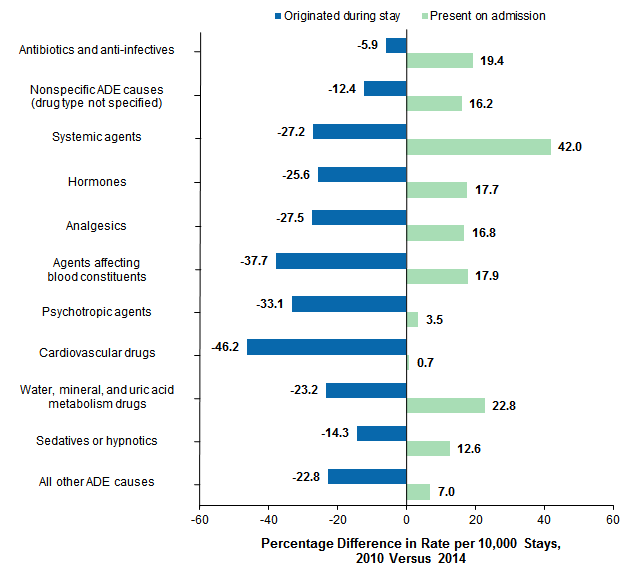 Figure 2 shows the percentage difference from 2010 to 2014 in the rate per 10,000 inpatient stays involving ADEs by the most common causes of ADEs. Results are presented separately for ADEs that originated during the hospital stay and those present on admission to the hospital. Bar chart that shows the percentage difference in rate of inpatient stays involving an ADE per 10,000 stays in 2010 and 2014 by cause and origin of ADE. Antibiotics and anti-infectives: -5.9% originated during stay, 19.4% present on admission. Nonspecific ADE causes (drug type not specified): -12.4% originated during stay, 16.2% present on admission. Systemic agents: -27.2% originated during stay, 42.0% present on admission. Hormones: -25.6% originated during stay, 17.7% present on admission. Analgesics: -27.5% originated during stay, 16.8% present on admission. Agents affecting blood constituents: -37.7% originated during stay, 17.9% present on admission. Psychotropic agents: -33.1% originated during stay, 3.5% present on admission. Cardiovascular drugs: -46.2% originated during stay, 0.7% present on admission. Water, mineral, and uric acid metabolism drugs: -23.2% originated during stay, 22.8% present on admission. Sedatives or hypnotics: -14.3% originated during stay, 12.6% present on admission. All other ADE causes: -22.8% originated during stay, 7.0% present on admission. ADEs due to cardiovascular drugs had the largest decrease in rate among ADEs that originated during the inpatient stay. ADEs due to systemic agents had the largest increase in rate among ADEs that were present on admission. Rates decreased from 2010 to 2014 across all ADE causes that originated during the hospital stay. The largest decreases were for cardiovascular drugs (down 46.2 percent), agents affecting blood constituents (down 37.7 percent), and psychotropic agents (down 33.1 percent). Rates increased from 2010 to 2014 across all ADE causes that were present on admission. The largest increases were for systemic agents (up 42.0 percent); water, mineral, and uric acid metabolism drugs (up 22.8 percent); and antibiotics and anti-infectives (up 19.4 percent). 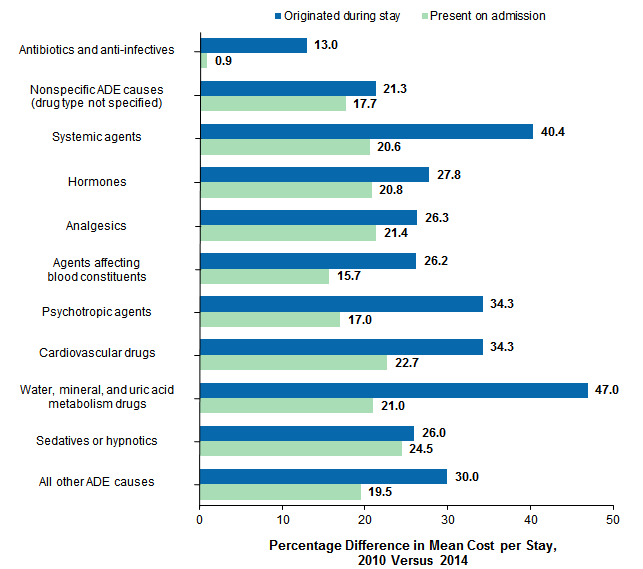 Figure 3 shows the percentage difference from 2010 to 2014 in the average inflation-adjusted cost of stays involving ADEs by the most common causes. Results are presented separately for ADEs that originated during the inpatient stay and those present on admission to the hospital. a Mean cost per stay in 2010 was inflation adjusted using 2014 as the base year. Bar chart that shows the percentage difference in mean cost per stay involving an ADE between 2010 and 2014 by cause and origin of ADE. Antibiotics and anti-infectives: 13.0% originated during stay, 0.9% present on admission. Nonspecific ADE causes (drug type not specified): 21.3% originated during stay, 17.7% present on admission. Systemic agents: 40.4% originated during stay, 20.6% present on admission. Hormones: 27.8% originated during stay, 20.8% present on admission. Analgesics: 26.3% originated during stay, 21.4% present on admission. Agents affecting blood constituents: 26.2% originated during stay, 15.7% present on admission. Psychotropic agents: 34.3% originated during stay, 17.0% present on admission. Cardiovascular drugs: 34.3% originated during stay, 22.7% present on admission. Water, mineral, and uric acid metabolism drugs: 47.0% originated during stay, 21.0% present on admission. Sedatives or hypnotics: 26.0% originated during stay, 24.5% present on admission. All other ADE causes: 30.0% originated during stay, 19.5% present on admission. The largest increases in average cost per stay were for ADEs due to water, mineral, and uric acid metabolism drugs (among ADEs that originated during the hospital stay) and sedatives or hypnotics (among ADEs that were present on admission). Compared with 2010, the average inflation-adjusted cost per stay in 2014 was higher for all common ADE causes, regardless of origin of the ADE. However, cost increases were higher for ADEs that originated during the stay than for those present on admission. The largest increases in costs for ADEs that originated during the stay were for water, mineral, and uric acid metabolism drugs (up 47.0 percent) and systemic agents (up 40.4 percent). The largest increases in costs for ADEs that were present on admission were for sedatives or hypnotics (up 24.5 percent) and cardiovascular drugs (up 22.7 percent). Figure 4 shows the percentage difference from 2010 to 2014 in the average length of stay involving an ADE by the most common causes. Results are presented separately for ADEs that originated during the hospital stay and those present on admission to the hospital. Bar chart that shows the percentage difference in mean length of stay involving an ADE between 2010 and 2014 by cause and origin of ADE. Antibiotics and anti-infectives: 2.6% originated during stay, -5.4% present on admission. Nonspecific ADE causes (drug type not specified): 12.8% originated during stay, 6.3% present on admission. Systemic agents: 32.9% originated during stay, 4.8% present on admission. Hormones: 17.1% originated during stay, 4.7% present on admission. Analgesics: 20.8% originated during stay, 11.9% present on admission. Agents affecting blood constituents: 21.7% originated during stay, 2.8% present on admission. Psychotropic agents: 32.3% originated during stay, 15.4% present on admission. Cardiovascular drugs: 29.4% originated during stay, 7.4% present on admission. Water, mineral, and uric acid metabolism drugs: 37.8% originated during stay, 6.2% present on admission. Sedatives or hypnotics: 14.5% originated during stay, 16.2% present on admission. All other ADE causes: 15.2% originated during stay, 10.7% present on admission. The ADE causes with the largest increases in average length of stay were water, mineral, and uric acid metabolism drugs (among ADEs that originated during the hospital stay) and sedatives or hypnotics (among ADEs that were present on admission). Between 2010 and 2014, the average length of stay increased for all common ADE causes, regardless of origin of the ADE (with one exception: antibiotics and anti-infectives that were present on admission decreased 5.4 percent). For all ADEs except sedatives or hypnotics, the average length of stay increased more when the ADE originated during the stay than when it was present on admission. For ADEs that originated during the stay, the largest increases in length of stay were for water, mineral, and uric acid metabolism drugs (up 37.8 percent) and systemic agents (up 32.9 percent). For ADEs that were present on admission, the largest increases in length of stay were for sedatives or hypnotics (up 16.2 percent) and psychotropic agents (up 15.4 percent). The estimates in this Statistical Brief are based upon data from the Healthcare Cost and Utilization Project (HCUP) 2010 and 2014 State Inpatient Databases (SID) from 28 States that include data elements designating whether adverse drug event (ADE) diagnoses were present on admission or originated during the stay. The States are Arizona, Arkansas, California, Florida, Hawaii, Illinois, Indiana, Iowa, Kansas, Kentucky, Maine, Maryland, Massachusetts, Michigan, Minnesota, Montana, Nebraska, Nevada, New Jersey, New Mexico, New York, Oklahoma, Oregon, Rhode Island, South Carolina, Tennessee, Virginia, and Washington. All numbers noted in the text and included in the tables are actual values, not estimates, because the data include a census of discharges rather than a sample of discharges. In other words, we count the actual number of hospital stays with an ADE in the 28 States. Because we analyze numbers for the actual population rather than a sample, there is no need to estimate how well the sample represents an underlying population. As a result, there is no sampling error associated with the calculated values presented, and significance testing is not necessary. Differences over time are reported by comparing values in 2010 with values in 2014. Effective with the fiscal year 2012 revision of ICD-9-CM codes, code 284.1 (pancytopenia) was subdivided into and replaced by codes 284.11 (antineoplastic chemotherapy induced pancytopenia), 284.12 (other drug induced pancytopenia), and 284.19 (other pancytopenia). The original code list included code 284.11 under the "antineoplastic drugs" ADE cause and code 284.12 under the "nonspecific ADE causes" category. Because the earlier 284.1 code, which existed during 2010, could not be discriminated between the two ADE cause categories and included "other pancytopenia," we excluded the pancytopenia codes (284.11 and 284.12) from our analysis to ensure an equivalent comparison between 2010 and 2014. Effective with the fiscal year 2011 revision of ICD-9-CM codes, code 970.8 (poisoning by other specified central nervous system stimulants) was subdivided into and replaced by codes 970.81 (poisoning by cocaine) and 970.89 (poisoning by other central nervous system stimulants). Both 970.81 and 970.89 were classified under the "central nervous system drugs" ADE cause on the original code list. We added code 970.8 to "central nervous system drugs" to account for this type of poisoning in 2010. Effective with the fiscal year 2012 revision of ICD-9-CM codes, code 999.4 (anaphylactic reaction due to serum) was subdivided into and replaced by codes 999.41 (anaphylactic reaction due to administration of blood and blood products), 999.42 (anaphylactic reaction due to vaccination), and 999.49 (anaphylactic reaction due to other serum). The original code list included code 999.42 under the "vaccines" ADE cause. Because the earlier 999.4 code included anaphylactic reactions due to causes other than vaccines, we excluded code 999.42 from our analysis to ensure an equivalent comparison between 2010 and 2014. Effective with the fiscal year 2012 revision of ICD-9-CM codes, code 999.5 (other serum reaction) was subdivided into and replaced by codes 999.51 (other serum reaction due to administration of blood and blood products), 999.52 (other serum reaction due to vaccination), and 999.59 (other serum reaction). The original code list included code 999.52 under the "vaccines" ADE cause. Because the earlier 999.5 code included serum reactions due to causes other than vaccines, we excluded code 999.52 from our analysis to ensure an equivalent comparison between 2010 and 2014. Table 3 summarizes specific ADE causes that are included within each ADE cause category reported in this Statistical Brief. The exact diagnoses that are included in each ADE cause category are provided in the appendix for this Statistical Brief. Note: Refer to the separate appendix available on the HCUP-US website for the detailed list of all ICD-9-CM diagnosis codes included for each ADE cause. Present on admission was determined for each discharge diagnosis based on two types of present-on-admission indicator flags in the SID: (1) a diagnosis-specific flag that indicates whether each diagnosis was present on admission and (2) an E code flag that indicates whether each external cause of injury was present on admission. After discharges that did not meet standard present-on-admission edit checking were excluded,8 the final analysis file for this Statistical Brief included 44,316,684 discharges (95.8 percent of all discharges across the 28 States in 2010 and 2014). For this Statistical Brief, when more than one payer is listed for a hospital discharge, the first-listed payer is used. Other payers were not reported. Community-level income is based on the median household income of the patient's ZIP Code of residence. Quartiles are defined so that each State's population is evenly distributed. Cut-offs for the quartiles are determined annually using ZIP Code demographic data obtained from Claritas, a vendor that adds value to data from the U.S. Census Bureau.9 The value ranges for the income quartiles vary by year. The income quartile is missing for patients who are homeless or foreign. For other information on adverse events and patient safety in U.S. hospitals, including adverse drug events, refer to the HCUP Statistical Briefs located at www.hcup-us.ahrq.gov/reports/statbriefs/sb_adverse.jsp. Weiss AJ (IBM Watson Health), Freeman WJ (AHRQ), Heslin KC (AHRQ), Barrett ML (M.L. Barrett, Inc.). Adverse Drug Events in U.S. Hospitals, 2010 Versus 2014. HCUP Statistical Brief #234. January 2018. Agency for Healthcare Research and Quality, Rockville, MD. www.hcup-us.ahrq.gov/reports/statbriefs/sb234-Adverse-Drug-Events.pdf. 2 Poudel DR, Acharya P, Ghimire S, Shital R, Bharati R. Burden of hospitalizations related to adverse drug events in the USA: a retrospective analysis from large inpatient database. Pharmacoepidemiology and Drug Safety. 2017;26(6):635-41. 4 National Center for Health Statistics. Health, United States, 2016: With Chartbook on Long-Term Trends in Health. Hyattsville, MD: National Center for Health Statistics; 2017. 6 U.S. Department of Health and Human Services. National Action Plan for Adverse Drug Event Prevention. U.S. Department of Health and Human Services. 2014. health.gov/hcq/pdfs/ade-action-plan-508c.pdf. Accessed September 29, 2017. 7 Weiss AJ, Elixhauser A, Bae J, Encinosa W. Origin of Adverse Drug Events in U.S. Hospitals, 2011. HCUP Statistical Brief #158. July 2013. Agency for Healthcare Research and Quality, Rockville, MD. www.hcup-us.ahrq.gov/reports/statbriefs/sb158.pdf. Accessed November 30, 2017. 8 Barrett ML, Owens PL, Bolhack J, Sheng M. Examination of the Coding of Present-on-Admission Indicators in Healthcare Cost and Utilization Project (HCUP) State Inpatient Databases (SID). 2015. HCUP Methods Series Report #2015-06. September 1, 2015. U.S. Agency for Healthcare Research and Quality. www.hcup-us.ahrq.gov/reports/methods/2015-06.pdf. Accessed September 27, 2017. 9 Claritas. Claritas Demographic Profile. www.claritas.com. . Accessed June 23, 2017. Internet Citation: Statistical Brief #234. Healthcare Cost and Utilization Project (HCUP). January 2018. Agency for Healthcare Research and Quality, Rockville, MD. www.hcup-us.ahrq.gov/reports/statbriefs/sb234-Adverse-Drug-Events.jsp.